52,440 views Published on April 29, 2004 in Review. 0 Comments Tags: Article, David Pizzanelli, Digital Holography, Direct-write. David is the Sales and Marketing Manager for Light Impressions International Ltd. He has been actively involved in the hologram industry since 1979, as Holographer and Director at Hollusions Ltd Cambridge and at SEE 3 Holograms Ltd London. 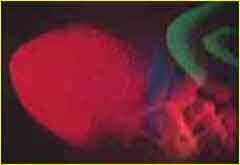 In 1994 he was awarded a PhD in Holography at the Royal Collage of Art, London. David has served on the Board of the IHMA and as Chairman of the IHMA, and is an acknowledged expert on the subject of security holograms. Holography has in the past been acknowledged as the most realistic of three-dimensional imaging techniques giving, on occasion, an image of an object that was so life-like that a casual observer might mistake the virtual effigy for the real thing. Before white light reflection holograms became generally available the only holograms that anyone could see were laser transmission holograms. 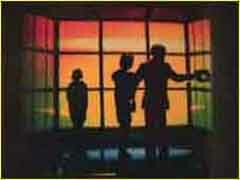 Looking into a laser transmission hologram was like looking through a window into another world. As one peered through the glass plate one could not only see the subject of the hologram, but the optical components behind it and often the laser table as well. If it was a pulse laser transmission hologram sometimes one could see the whole room, with people standing in the behind the laser table, just by looking through a small piece of glass. It was like looking through a magic letter box into the laser laboratory and was (and still is) quite a magical and uncanny experience. The only people (apart from scientists and holographers) who actually got to see these early holograms were reporters and journalists writing about the new medium. Looking at these spectacular laser transmission holograms they wrote up very enthusiastic reports in newspapers and magazines about how truly amazing and life-like holograms were and then went on to speculate about how soon we would all be looking at hologram TV and hologram billboards in the sky. 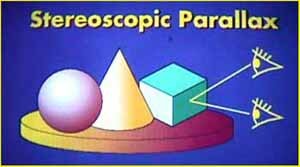 Long before the general public ever got to see them it was generally known and accepted that Holography was something new and extraordinary. 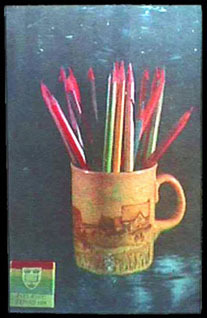 In his book “Travels in Hyper-reality” Umberto Eco said that holography provided the spectator with an image that is “Absolutely iconic, a perfect likeness, a ‘real’ copy of the reality being represented”  he went on to say that “Holography … achieves full-colour photographic representation that is more than three-dimensional” and that “Holography could only prosper in America, a country obsessed with realism, where if a reconstruction is to be credible, it must be absolutely iconic, a perfect likeness, a “real” copy of the reality being represented” . 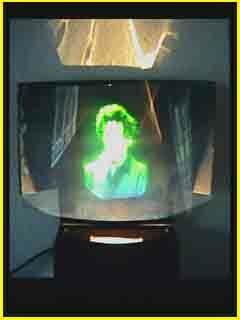 By the time white light viewable holograms were available to the general public it was already widely established that holography was the perfect imaging medium. Size – The film and plate materials used were so expensive that very few holograms were made that were larger than 30 × 40 cm and the majority were 10 × 8 inches or smaller. All subjects had to be the same size as the final hologram image. Immobility – Unless a pulse laser was used, the subject had to be a solid object, even items that most people would think of as “stationary”, such as a vase of flowers or a bowl of fruit, could not be used because of the severe constraints of immobility. Colour – There have been several multi-colour and even full-colour silver-halide holograms made, but the process was so complex that to date they have served as examples of different holographic techniques rather than established commercial processes. 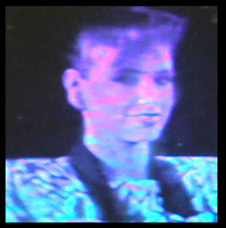 Location – Even if a pulse laser were used to record a moving subject, such as a human portrait, the subject had to be brought into the studio to have the hologram made. All exposures were “in camera”: they had to be made within the darkened studio that was lit only by safelights and thus the subject matter was restricted to what could be physically brought into the studio. As Dr. Stephen Benton, inventor of the rainbow hologram, once put it, “the disappointing reality for the general public when they go to buy a hologram is that they find them to be three-dimensional images of small dead things”. If a designer or an artist wanted to have a hologram made then his or her concept would have to be interpreted by the holographer, and quite often by a model-maker as well, before the final image was realised. 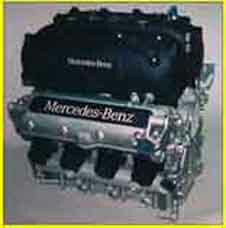 If one wanted to have a white light rainbow hologram made of a car engine, for example, a 3D scale model would have to be made because the real engine would be far too large to fit onto the holography table. 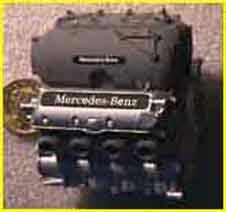 The 3D model would have to be perfect in every detail but only a tiny fraction of the size of the actual engine. It would have to be carefully painted in grey-scale to reflect the right amount of laser light to produce a realistic image. If the hologram image was to be in more than one colour then the model would have to be painted again in grey-scale for each exposure. The colours in the final image would be determined by the geometry rather than the wavelength of the the laser beams. The final hologram image would be exactly the same size as the 3D model as all classical holograms have a 1:1 ratio between the image and the object recorded. This meant that even if the object were of a convenient size to put onto the holography table it could not be used directly if the final image was required to be a slightly different size. This 1:1 ratio is a natural consequence of the way that a classical hologram automatically records every minute detail of the physical object, including its size, but it is seen as a severe limitation by artists and designers who are used to blowing up and reducing photographic images to any size that is required. Artists wanting to use holography to make works of fine Art learned to disguise the limitations of the medium so that observers were unaware of them. What may have seemed effortless beauty was in fact the product of much skill and resourcefulness on the part of the artist. “Forth Wall”: Artist Dan Schweizer made intricate models like tiny stage sets for his holograms. “In the Sea of Tranquilly”: Artist John Kaufman made beautiful multi-colour holograms of rocks. Artists such as Doris Vila, Rudie Berkhout, Dieter Jung, Kazuo Hatano, Ikuo Nakamura, Shunsuke Mitamura, Setsuko Ishii, Jeffrey Robb and many others created works that used the elements of space, time and colour within the hologram to create images that were far more powerful and beautiful than the sometimes quite humble objects that were used in their creation. In general display holography the use of solid 3D models and small objects, and the “photo-booth” style pulse laser portraits of people and animals, proved a great disillusionment to the general public who had grown accustomed to the wealth and variety of subject matter offered by cinema, photography and television. In order to provide the same abundance and diversity of imagery that is provided daily by other visual media, Holography has to be used as the means of presentation of sequences of photographs and images from other media and not simply as a direct medium for recording the subjects that could be taken into the dark confines of the the laser studio. From the very start holographers realised that there had to be a marriage between holography and other imaging techniques, such as photography and cinematography, if holography was to survive beyond the first “era of novelty”, where the innovation of the medium itself was sufficiently interesting to be valued in itself, regardless of the actual subject matter. As early as 1968, R.V. Pole saw the potential of holography in the context of auto-stereoscopic displays, i.e. the means of providing stereoscopic 3D images without the need for wearing special glasses, or looking through a viewer . There are several forms of auto-stereoscopic displays , many of which derive from Gabriel Lippmann’s proposal in 1908 to gather a range of perspective views onto a photographic emulsion by means of an array of spherical lenses, called “fly’s eye” lenses, and then to retro-project them to synthesize a three-dimensional image . Pole wrote that he hoped his technique would “offer a means of closing the “white-light circle” in holography by providing a method of taking a picture of a 3D scene in natural light.” In the same year, George and McCrickerd completed some practical fieldwork in the form of scenic stereograms of the Yosemite Valley and the city of Pasadena using the nine-story Millikan Library building as a platform to take the original footage . In May 1968, D. J. De Bitetto, working at the Phillips Laboratories, described a method of recording a very narrow horizontal strip hologram for viewing of the virtual image of the 3D scene [7, 8, 9]. Then, in October 1969, Dr. Stephen Benton proposed a two-step technique , where the second hologram is illuminated to reconstruct a real image of the first hologram the strip that replays the image in each wavelength of the spectrum in turn, to give the bright diffractive colours of a “rainbow” hologram. In the early 1980’s Benton suggested that a linear pass by the subject (with a movie camera on a linear rail) would give less optical distortion in the image than rotating the subject on a turn-table. 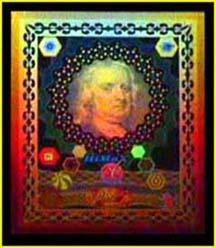 The rainbow hologram was the foundation of the embossed hologram technology, and even prior to the advent of embossing it set the direction that holograms derived from photographic images would go. Within a short time of seeing the first “rainbow hologram”, Lloyd Cross produced a composite hologram comprising some 1080 image strips, each of which was a one-step white-light viewable rainbow hologram. Collectively the image strips formed a cylindrical display that gave a 360∘ view of the subject. Whilst the Multiplex Company was making cylindrical displays on silver halide film, other holographers, like Ken Haines, Mike Foster and Steve McGrew were working on methods to mass-replicate “rainbow” holograms onto plastic materials. 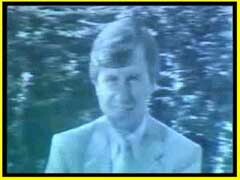 This was to profoundly affect the economics of producing holographic images and to give rise to a whole new industry. 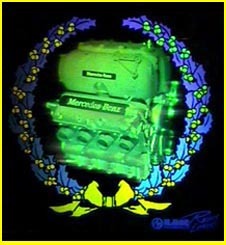 Steve McGrew’s company, Light Impressions Inc, was the first to bring the embossed hologram to the commercial market with a set of embossed images of 3D subjects. 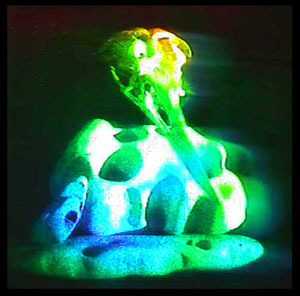 The images were typical of the “classical” studio holography of the silver halide era, one of the best examples being a still life called “Skull and Rocks” by the artist holographer John Kaufman. The hologram is 6′′× 6′′; and the visual depth of the image is a similar amount when the hologram is correctly illuminated with a halogen spotlight. Steve McGrew was quick to realise that if commercial clients were to make use of the new medium of embossed holography then there had to be a better way to allow them to specify the image they required. McGrew abandoned full 3D depth in favour of diffractive colour  and developed a system now known as “2D–3D”, whereby a client could send in black and white line artwork and this would be converted into a hologram set on two planes, one set on the surface and one appearing a few millimetres behind. 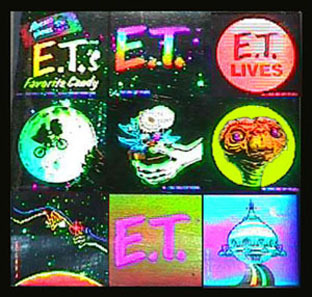 With the release of the “E.T.” diffractive graphic stickers in 1982, 2D–3D was launched and became the most popular hologram imaging format of the 1980’s. Although the first embossed stereogram was released soon afterwards, the ease and simplicity of the 2D–3D technique, meant that 3D images originated with a movie camera and a subject on a turntable were both expensive and complicated compared to the new graphic technology which required very little from the client in terms of preparation of artwork. 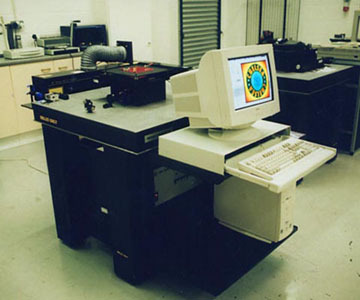 As most clients simply wanted their logo displayed as a diffractive composition, and as company logos were usually in the form of bold graphics designed to look good on letterheads, the 2D–3D system allowed clients to specify custom holograms with ease. 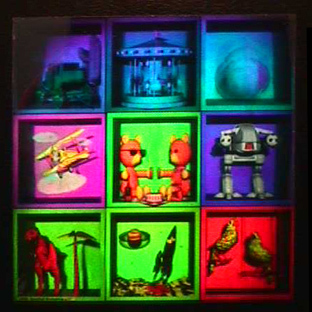 When Light Impressions introduced their “True-colour” technique, which permitted 2D–3D holograms to be made from full natural colour photographs and transparencies, by use of diffractive RGB colour control, 2D–3D was given a new boost for promotional contexts where photo-realism was more appropriate than the graphic style of line artwork. 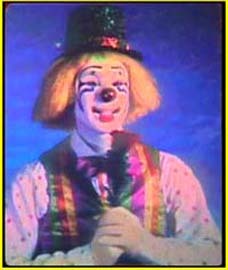 Although there were notable exceptions, such as the portraits of Stevie Nicks and Michael Jackson, by Craig Newswanger at CFC Applied Holographics, and the Clown by Ken Haines, at American Banknote Holographics, there were relatively few full-colour embossed multiplex holograms made in the mid 1980’s and early 1990’s. This was in part because of the cost of making the original stereoscopic cine film, but also because alignment of the three colour separations from the stereoscopic cine film footage gave rise to significant registration challenges in the holography studio. The complications of image alignment using cine film were alleviated by the introduction of video that could be manipulated in a computer to correct colour balance and luminosity, whilst still maintaining digital control of the placement of the image within the frame. When Ken Haines was at Simian, for example, he produced some beautiful examples of full-colour portraits with small amounts of animation, such as a slight smile, or movement of the eyes, just sufficient to communicate the living presence of the subject. 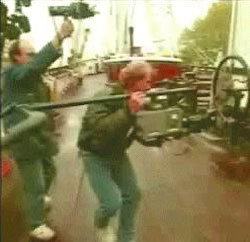 Steve Smith, of Lasersmith, produced a novel way of controlling or eliminating all subject motion, by shooting 35 mm film from a series of still cameras rather than a moving cine camera . In the UK Rob Munday produced a novel system for recording sterograms from an LCD screen rather than from film frames, so that the parallax recording could be done on video, rather than an expensive cine camera, or alternatively data such as 3D computer models could be directly downloaded from computer . In the Netherlands, Walter Spierings developed a system for making colour 3D stereograms, also using an LCD screen, but providing, instead of the conventional H1–H2 system, a one-step imaging process he called the “Office HoloprinterTM” . Several holographers were working on methods to exploit the control that image manipulation in computers gave to the process by finding a way to directly output a digital image as a hologram. In 1988 Fujio Iwata and Kazuhiko Ohuma, of Toppan Printing Co Ltd, introduced their novel process for making animated diffractive patterns by exposing several tiny dots of grating. The system allowed for the variable grating pitch to build up a multi-colour image and, more spectacularly, had the ability to change the orientation of the grating (by rotating the substrate) to provide dazzling animated patterns [15, 16, 17]. “This method needs much time over imagination”, as they put it in their 1988 paper, but the effort was worthwhile, as the tiny animated images were very difficult to achieve by any other holographic method, such as 2D–3D, and were going to be significant in the emerging security market. Within a few months other companies working on similar systems were displaying holograms made by the “dot-matrix” technique [18, 19, 20]. 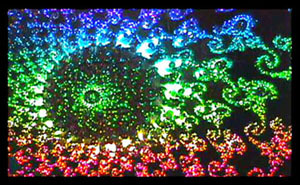 The animated images were bright, colourful and very distinctive. Before long, however, it became clear that the real advantage was that the system required no real holographic skills to operate and that the true skills were in the design of the image. For the first time it was the designer working at a computer with the latest graphic software who contributed more to the look of the final hologram image than the holographer. The dot-matrix image could be shown on the monitor cycling through the colours, and presenting a good simulation of the final product. Designs could be quickly modified and easily displayed to the client for approval. Within a few years dot-matrix had replaced 2D–3D as the most popular imaging technique. Several of the holographers working on the dot-matrix systems realised that if either the lateral viewing zone of each pixel could be controlled, or the real-estate of the photo-resist divided into a sub-matrix of cells for different viewing zones, then it would be possible to build up a sequence of stereoscopic views using direct-write methods. If the pitch of the grating could be varied for each pixel then multi-colour or true-colour 3D image could be directly written to the hologram. 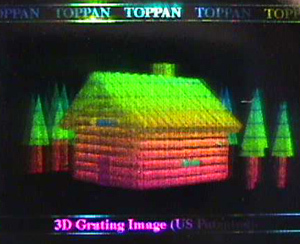 In May 1994 Toppan published their first multi-colour 3D embossed image made from their high-resolution direct-write technique. Displaying a computer generated scene with at least a dozen perspective views, the tiny image has five clearly discernable colours. One of the most significant aspects of the “3D grating image” is that it is not actually a hologram at all, in that no interference wavefronts, or even lasers, are employed in its fabrication. The images consist of anywhere from several tens of thousands to several hundreds of thousands of minute gratings prepared by an electron beam . As well as Toppan in Japan, the Dai Nippon Printing Co Ltd also researched methods of using an electron beam to make directly written computer-generated holograms. In 1998 3D images, such as wire-frame models, were fabricated as computer-generated holograms (CGHs) . The following year they extended the technique to make multi-colour 3D images  and research is presently underway to make large-format CGHs [24, 25]. In Taiwan, Ahead Optoelectronics Inc developed a dot-matrix system that uses optical exposure methods to provide 3D images in full natural colour with graduated tonal values. Traditional dot-matrix printers did not have the ability to create true colour holograms effectively because they could not vary the pitch of each grating pixel, but the SparkleTM machine gets around this limitation and allows one to specify the exact pitch, angle and spot size of every pixel. 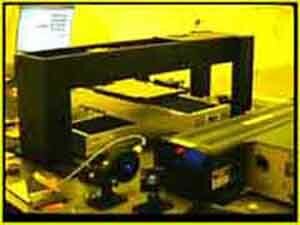 The system has the capability to vary the spot size from 150 dpi to 1,300 dpi. The grating pitch can be varied within each pixel from 0.7 to 2.5 to give a wide colour range. In fact it is arguable that technique offers a wider colour gamut than, for example, a 2D–3D true-colour made with single red, green and blue diffractive primaries, because any of the pixels can be set to a wide range of different colours . In practice, a full natural-colour 3D image is presently limited to three stereoscopic channels, but the example of the small stereogram of a porcelain dragon has an authentic realism, reminiscent of “classical” full-colour reflection holograms. 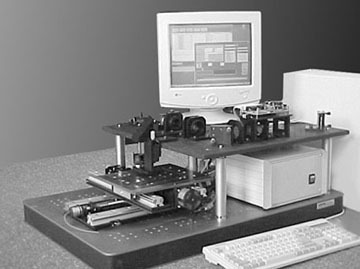 The Kinemax, developed by Polskie Systemy Holograficzne, is another exciting new direct-write technology, whose main distinction from conventional direct-write, or dot-matrix systems is that several “optical interference fields” are recorded at the same time in different areas to give multiple gratings. Thus the “resolution cells” that are written are not separated into discrete dots of diffraction grating, like conventional dot-matrix spots, but form a continuous recording over relatively large areas. The KinemaxTM high-resolution direct-write system. The resolution within each cell is up to 6,000 dpi, with both pitch and fringe direction defined within each cell. The KinemaxTM technology offers recording of 3D objects as full true-colour stereograms composed of up to 30 stereo views with 3D image resolution of the order of 4000 dpi, with three sets of gratings corresponding to the primary additive colours. The stereogram can be built up from a series of rendered images (in the case of a virtual 3D scene) or a set of digitized photographs (for real objects). Each image represents a view of an object from one direction. Basic colour views from one point in the hologram plane are composed of basic colour components from points at the same locations on subsequent images. Pawel Stepien, who also worked on the HolomaxTM system, points out some of the advantages of KinemaxTM are that the basic cell, or pixel, “is composed of a set of diffraction gratings with spatial frequencies corresponding to directions of subsequent views and fringe contrast being responsible for given point-direction combination amplitude. The process does not contain any Fourier transform calculations, and can thus be performed directly by grating recorder in line with recording. It is also possible, unlike in the CGH based stereogram, to scale a 3D image without any additional calculations” . In the UK, Spatial Imaging Ltd saw dot-matrix as having the potential to deliver everything that their earlier Di-HoTM stereogram system had done, but without the requirement for specialist skills. “Absolutely no knowledge of holography is required” to originate one-step hybrid 2D–3D and 3D holograms on the new Lightgate 3000 “3DigitalTM” machine . The 3DigitalTM images have several advantages over classical stereogram holograms: they are brighter, with higher contrast and more saturated colours. Imagery is sharper and more detailed, even in semi-diffuse lighting conditions. The grating structures are easier to emboss, and survive application onto substrates that are not rigid or optically flat. Previously stereograms embossed into hot-stamping foil had to be applied to very smooth substrates, such as plastic cards, to avoid degrading the image. 3DigitalTM holograms can be created from up to 64 stereoscopic images in a resolution of up to 3,064 dpi (some 9 million pixels per square inch). Software balances the red, green and blue exposures for each pixel, using a proprietary algorithm, so that the final hologram displays bright saturated colour throughout the spectral range and both the angle of diffraction and the spatial frequency can be continuously varied. In the US, Pacific Holographics have used their patented SecureTextTM dot matrix system to produce multicolour 3D images at resolutions up to 3200 dpi (over 10 million pixels per square inch). The system allows the operator to control the grating angle, spatial frequency and brightness of every pixel to achieve RGB colour blending as well as gamma control . A typical data file for a colour dot matrix hologram contains information from 16 individual frames with a 2∘ or 3∘ angular deviation between frames to provide stereoscopic parallax, depending on the hologram size and subject matter. The images are bright and sharp with good colour saturation and wide angle of view. Light Impressions International Ltd, in the UK, offer two full-colour direct-write technologies, HiMax and BrandMax, both of which allow the designer an artwork resolution of 16,000,000 pixels per square inch. That level of resolution means that each diffractive pixel is like a small white sugar cube on a football pitch. In the case of HiMax each of the diffractive pixels is written at a much higher resolution still, with a point size of just 15nm (over six billion points per square inch). The BrandMax technology allows designers untrained in holography to make the image on their own computers and control exactly how the final result should look using digital 3D models made with off-the-shelf software. The 3D model is rotated to give the desired angle of view, yielding up to 50 frames of stereoscopic parallax, in full colour, with animation if required. As the information is digital and is downloaded directly to make the BrandMax diffractive image, the final result looks very similar to the 3D model as seen on the computer monitor with the colours appearing as they should when the image is viewed at the correct vertical viewing position. BrandMax – Light Impressions International Ltd. The BrandMax system also allows designers to make full colour 3D images of live events using digital video either by rotating the subject or by moving the video camera past the subject scene in an orbital or a linear pass. Other researchers are still keeping their results under wraps. However, it is clear that sufficient work is going on in the field at the moment to make it likely that direct-write full-colour 3D holograms will be the most popular holographic imaging process within the next few years. The present limitations in the size of direct-write 3D full-colour diffractive images may soon be overcome by pulse laser direct-write systems such as the i-SCANTM technology, shown at Holo-Pack in November 1999, exposing pixels at speeds of up to a thousand of dots per second. The i-SCANTM system directly ablates the image into the plastic shims used for soft embossing. Not only does it do away with the holographer, as it bypasses the need for a photoresist plate, but it also dispenses with the electro-former, nickel shims and plating baths. Gone too, is the need to recombine small images together to make larger shims, as large format seamless cylinders can be directly ablated with multiple images. Production time is reduced from a couple of weeks to a couple of hours, a vital factor in making holography a mainstream imaging medium . 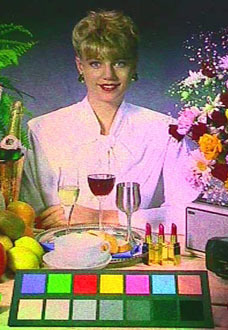 Conventional printing (left) is combined with an embossed dot-matrix hologram (centre) to provide a dynamic result (right) for a TV guide. When the i-SCANTM system is able to produce full-colour 3D holograms in a similar way to the BrandMaxTM or 3DigitalTM or other full-colour 3D direct-write technologies, then an exciting range of new subject matter will be available that contains full parallax and natural colour. The capability of directly writing relatively large format full-colour 3D holograms (of a size sufficient to cover a book, magazine or poster, for example) coupled with the ability to combine the image with conventional printing, may finally allow holography to integrate with mainstream publishing. The recent advances in computing power, software and related digital technology means that far broader subject matter can be imported from other media which already contains parallax data. There is a vast amount of parallax data available today that is recorded and stored digitally. More parallax is used in television, video and film than ever before, as directors have come to realise that a roving camera can convey far more realism than a static camera. This is because the phenomena of “motion parallax” (or “temporal parallax”) is feeding 3D depth cues to the viewer even if the motion is only a few degrees and is too subtle to be consciously noticed by the audience. Not only in action-packed scenes, but also in relatively quiet scenes of dialogue, a small amount of temporal parallax from lateral camera motion adds a three-dimensional feel and a sense of “being there” that a fixed camera shot cannot convey. As well as fictional dramas and films, shots containing lateral or orbital camera motion are increasingly being used in television advertising commercials and in programmes such as wildlife and nature documentaries. On location, new light-weight video cameras can be hand-held to provide lateral temporal parallax with far more freedom of movement that conventional motion picture cameras, and new Digital Video (DV) formats allow for cameras to be much smaller with very little loss of picture quality. In the studio, the use of booms and pulleys to move the camera rapidly around allow for more temporal parallax than ever before, both in television and in cinema. It is now more common to shoot a sequence using a camera that can move rather than from one that has a fixed viewpoint, such as on a tripod. Temporal parallax can be captured with from any laterally moving or orbiting vehicle, such as a car, boat, train, plane, helicopter or hot-air balloon: anything that travels in a smooth motion past the scene will provide parallax data or “look-around”. Sequences that have temporal or motion parallax in them can be used to make a three-dimensional image as a direct-write digital hologram. The hologram is the means by which the temporal component is translated into a spatial component so the subject can be seen stereoscopically. In other words, the hologram turns a one-eyed view of the world into a two-eyed one, so that the subject can be clearly seen in 3D. Parallax is increasingly being used in special effects in movies. In the film “The Matrix”, for example, narrative motion is almost frozen by the use of parallax cameras that encircle the subject. 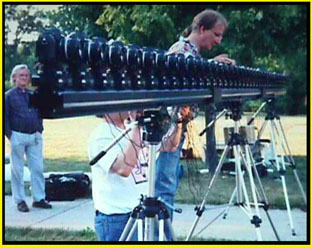 The many cameras each take a single image of the scene in sequence to build up a 360 degree (or more) view of the action. The cameras can be triggered to go off simultaneously or with a split-second delay between each one. Prior to shooting the short scene the camera path is carefully planned for each action. 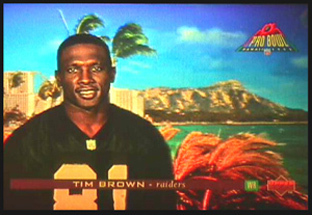 The cameras are embedded in a green wall so that they can be edited out later and a background added into the image. The camera path is computer controlled and each view can be matched to a corresponding view of the background, so that the subject and background are always spatially synchronised in the final shot . 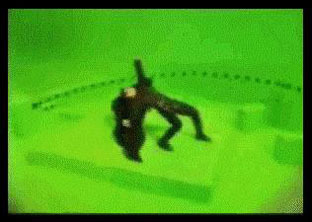 Since “The Matrix” several films have used this effect and it has also been used on television, for example in the “The X-Files”, and in several commercials. The use of computers and sophisticated video-editing software has changed the movie industry, making possible special effects that could not have been achieved even three or four years ago. The temporal parallax in these scenes can be readily converted to stereoscopic parallax for holography.